ADVANCED TICKETS REQUIRED. AVAILABLE HERE. 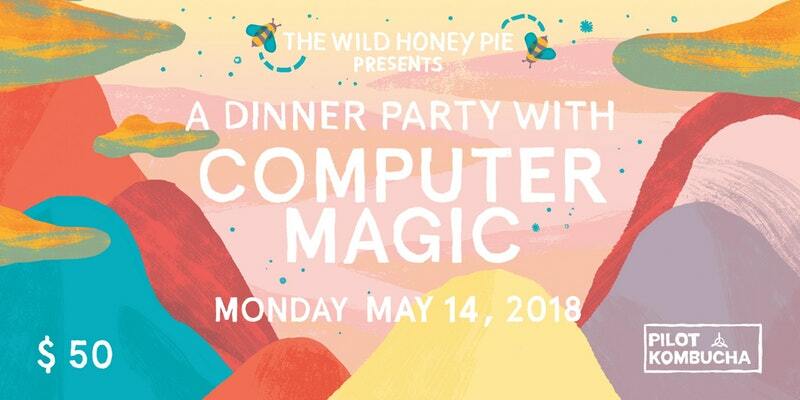 The Wild Honey Pie could not be more excited to invite you to our next dinner party concert featuring a special acoustic performance by Computer Magic. Songwriter and producer Danielle Johnson (also known as Danz) has a knack for creating an atmosphere. She released her sophomore album, Danz, this February, and it is full of shimmering synths and ethereal vocals that have the ability lift you off into another world. We will be celebrating this special evening at a new location for us, in the warm and vibrant Guadalupe Inn complete with a delicious three-course Mexican meal, unlimited beer and specialty cocktails made with delicious Pilot Kombucha. We are buzzing with excitement for what will be a truly electrifying and magical night. Click here to take a listen to Computer Magic and hear why we are so excited for this one. Want to experience more with The Wild Honey Pie? Join us at summer camp this Memorial Day weekend with a dozen bands at Welcome Campers. Tickets include food, alcohol, lodging and performances. This is a music festival for the kid in all of us. Stay in the loop with our weekly email newsletter.